Les began his remarkable real estate career in 1988 working for a small local company called Multiple Realty. He achieved success early on and decided to open his own real estate firm specializing in condo conversions—taking existing stratified rental buildings owned by a single person and selling them to individual owners. His experience and drive enabled him to sell an average of 250 units annually for several years. Not to be deterred by the 1993 condo market downturn in Vancouver, Les honed his innovative ideas and creative marketing style which propelled him into the 50 top producing realtors in the Lower Mainland, ranking among the top 1% of all realtors nationally. He reached a point where he was completing over 60 real estate transactions per year—nearly 17 times the industry average. It's an achievement that Les has never failed to accomplish ever since, despite fluctuating market conditions. Les attributes his success to superior market knowledge, outstanding negotiating skills and an unparalleled desire to meet client needs. 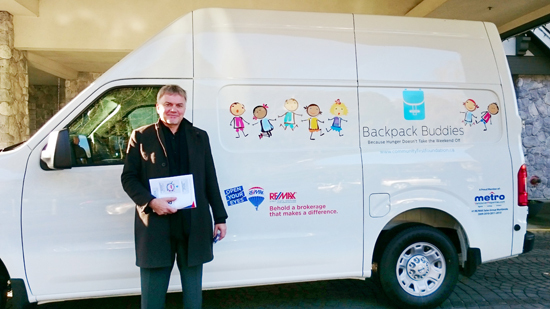 Backpack Buddies is a unique program that addresses a very real need in the Vancouver community while providing a tangible opportunity for kids to help other kids. Les contributes to this worthy cause. Click Here for further information on Backpack Buddies.